The Jovell is the newest addition to Flora Drive and is also the 2nd last plot of low density development is nestled within luxurious private residential enclave! This Quality 8 storey development with 428 units coupled with Lavish Waterscaping by Hong Leong Holdings Limited, CDL & TID. Residents are assured with efficient & functional 1 bedroom to 4 bedroom layout choices and sizes. This huge land size of 22,534.40sqm/ 242,558 sqft grants magnificent and alluring landscaping to the already tranquil environment with beautiful lavish waterscaping which makes coming home to The Jovell a joyous and pleasurable experience. 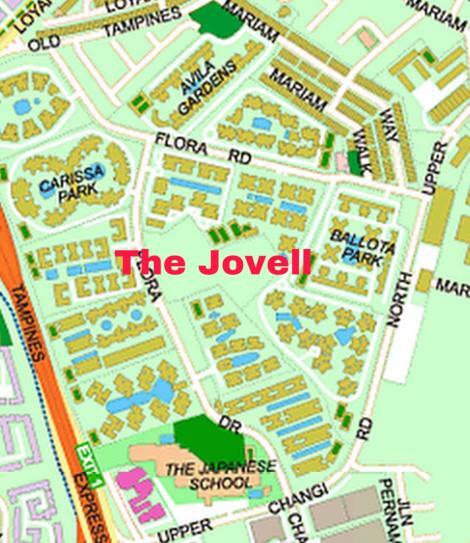 The Jovell is less than 10 minutes’ drive to Changi Business Park, Tampines Regional Centre and Project Jewel at Changi Airport ✈targeting to open in 1st half of 2019! It only 3 bus stops away to Upper Changi & Tampines East Downtown Line MRT station. MegaMart (IKEA, Giant, Courts Megastore) and Factory outlet (Changi City point) is just within a short drive away. With others amenities - , Tampines Mall, Eastpoint Mall, Whitesand and wet market is minutes away.